Edna Valley Market has just made a major change in how you purchase fuel & a car wash. Have you checked our new fuel price signs? No, they're not cash/credit prices... they're the prices you pay for fuel when you buy any car wash! We figured you need to wash you car & you need to fuel it up, so why not pay the lowest price for fuel possible AND enjoy our Autec Evolution car wash? It was voted runner up for Best Car Wash in the New Times Best of SLO County! Remember, we'll ask you if you want to buy a car wash BEFORE you fill up your car... that way we know whether or not to give you that discount of up to 20 cents per gallon! 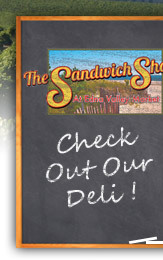 At Edna Valley Market... when you're in the market for more than just gas. Enter your email address below to receive our weekly specials and other announcements.